Samsung QE55Q8DN 4K QLED (2018) review | What Hi-Fi? This is something of a surprise: just months after announcing its 2018 TV range and weeks after the first examples landing in shops, Samsung has launched a brand new, hitherto unannounced model: the Q8DN. The idea is simple: squeeze the excellent, next-gen direct backlight of the Q9FN into a simpler and more affordable chassis. It makes perfect sense and, while the Q8DN isn’t quite as good as the Q9FN, it offers many of the core qualities - at a reduced price. There are sacrifices, of course – the biggest of which is the loss of Samsung’s OneConnect box, which moves the connections to a separate box that can be hidden out of the way, reducing cable spaghetti around the back of the screen. Without this, the Q8DN’s cables have to be run to the back of the screen. That’s a loss of neatness, particularly if you’re wall-mounting, but if you’re planning to plonk your new TV on a piece of furniture it won’t be a big deal. The stand could prove a bigger problem. Rather than an elegant pedestal-like those of the Q9FN, Q8FN, Q8CN or Q7FN, the Q8DN gets independent feet at either end of its chassis. Aesthetically there’s little to complain about, but the open-legged stance gives the TV a large overall footprint not every room will be able to accommodate. The other thing to bear in mind is, as with the Q9FN, the direct LED backlight results in a thick and heavy panel. From the front, the TV looks smart, thanks to thin, dark bezels - but from the side an OLED has a greater wow factor. MORE: OLED v QLED - which is the best TV technology? On the features front, the Q8DN gives nothing away to the Q9FN. The operating system is identical, even running on the same software version, and that means the array of apps is also identical. You get 4K HDR versions of Netflix, Amazon Instant Video, BBC iPlayer, Rakuten and Google Play Movies & TV. ITV Hub, All 4 and Demand 5 are also all on board, as are Now TV, Twitch, YouTube, Plex and Spotify. If you prefer to get your telly the old-fashioned way, you will be pleased to hear there’s a proper twin-tuner Freesat receiver on board too. MORE: Amazon Prime Video v Netflix - which is better? For HDR, the core HDR10 format is supported, as is the HLG format favoured by broadcasters such as the BBC. Samsung has shunned Dolby Vision in favour of its own, similar HDR10+ format – that’s a pain in the short term, as HDR10+ content is in short supply currently (a small amount of Amazon Prime Video content is available in HDR10+, but isn’t flagged), but that’s set to change over the coming months. Beyond simple content, Samsung’s Ambient mode enables the TV to show photos or pictures, or to blend into the wall behind it when not in normal use. It’s clever, particularly in blend-in mode, but we’re not sure how many buyers will take advantage (particularly those who don’t wall-mount their TV). MORE: Dolby Vision v HDR10 - which is better? At this point, the Q8DN’s sacrifices may seem worth making. After all, this is Q9FN picture quality on the cheap. But while that’s true to an extent, the Q8DN isn’t quite as good as the Q9FN. The difference becomes clear when playing HDR content. The brightness has been dialled back, and while the Q9FN will hit highs of around 2000 nits the Q8DN is limited to around 1500. 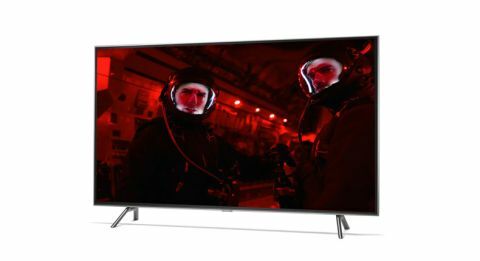 That’s still bright by prevailing TV standards, and far brighter than any OLED currently available, meaning the Q8DN is an exciting HDR performer in its own right. The Q8DN shares the core qualities and overall character of the Q9FN. It may have fewer independently dimmable backlight zones, but that isn’t obvious from the performance. The Q8DN appears to go just as black (almost OLED-black), without producing obvious blooming or clouding around bright objects on dark backdrops. The approach to colours is the same, too. The comparative reduction of brightness means the Q8DN can’t reveal the very light shades that the Q9FN can, and it isn’t quite as lush, but the general balance has the same combination of vibrancy and realism. We play a 4K Blu-ray of Blue Planet II, which switches between a colourful coral reef and freezing penguins in rapid succession. The Q8DN ensures the former is a feast for the eyes and the latter are naturally balanced. When David Attenborough makes his rare on-screen appearances, the Q8DN also proves to be just as capable of delivering life-like, nuanced skin tones. For detail and edge definition there’s really nothing to choose between the Q8DN and Q9FN, which means you’re getting one of the sharpest, most detailed 4K performances currently available. And when dropping down to 1080p or standard-def there’s even less to choose between the Q8DN and Q9FN - mainly because with standard dynamic range (SDR) content, the Q9FN’s extra nits have less effect. There are occasions when it’s possible to see the Q9FN going a touch brighter than the Q8DN (a neon sign on a dim city street, for example) or revealing some subtler shades in a dark, foreboding sky, but this is broadly the same, detailed, natural picture. The Q8DN requires little tweaking in order to perform at its best. For HDR, it’s simply a case of turning off the 'Eco' settings and settling on the level of motion processing you’re happy with. We also switch on the 'Game' mode when playing games, as this reduces input lag and enables the 'Game Motion Plus' mode, resulting in smoother in-game action. One disappointment with the Q8DN is it doesn’t sound as good as the Q9FN. It’s capable of bassy delivery, but it's a bit muffled and, comparatively, lacking clarity. The delivery is by no means terrible, but at this end of the market we expect more. Having said that, we would recommend adding a soundbar or surround package to a new TV, making the relative merits of a TV's built-in speakers irrelevant. Think of the Q8DN as a Q9FN with the brightness dialled down, and you’re pretty much there. This is the same sharp, detailed picture, with the same approach to colours (albeit with the loss of a little punch) and the same range of apps and picture processing smarts. Losing the OneConnect box is a shame, but perhaps not a big deal, so the only issue with the Q8DN is one of price. At the time of writing, it’s just £100 cheaper than the Q9FN, which isn’t nearly enough of a discount. But the Q8DN is brand new, while the Q9FN has dropped £500 since launch. If the Q8DN experiences a similar drop in the weeks to come, it will introduce a real quandary: do you buy a Q9FN, or a Q8DN and a soundbar for the same money? That’s a tough question, sure, but also one with no incorrect answer.